Non weight bearing status for 4 weeks post-op (resting foot on are okay). Patients are cleared to drive once they are off all narcotic pain medications and on size of repaired lesion. *Must be cleared by MD typically around week 3 or 4. Most patients will be in a posterior splint to maintain dorsiflexion and to remind them not to bear weight. Depending on the location of the articular cartilage defect and subsequent graft, patients may have active and/or passive range of motion restrictions. Light to no resistance stationary cycling is okay at 3 weeks post-op. No resisted inversion/eversion machines (isotonic or isokinetic) for 2 months. Low impact activities for 4 months post-op. Use of the Continuous Passive Motion Device (CPM) for 4-6 hours a day for 4 weeks is imperative. Icing and elevation every 2 hours for 15 minute sessions during wake hours. CPM (continuous passive motion machine) at home for at least 6 hours every day. Soft tissue treatments to surrounding areas (avoid bandages). Effleurage for edema. Lower extremity non weight bearing strengthening exercises (i.e. lying, seated, and standing straight leg raise exercises, isometrics, well-leg stationary cycling, upper body conditioning). Foot/ankle exercises consisting of intrinsic muscle strengthening (i.e. toe flexion/extension, arch). Gait non weight bearing x 4 weeks. Range of motion restrictions per MD (graft location). Manual resisted (PNF patterns) of the knee and hip. Range of motion, soft tissue treatments, and effleurage for edema. Non weight bearing aerobic exercises (i.e. unilateral cycling, UBE, Schwinn Air-Dyne noninvolved limb and arms only). AFTER 3 weeks, bilateral cycling with light to no resistance, slow cadence. Continue non-weight bearing strengthening exercises, 1 legged planks, side planks, glut exercises. M.D. visit at 4 weeks post-op, will progress to partial weight bearing and discontinue use of splint. 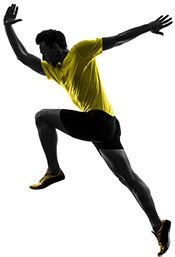 Progression to full weight bearing is dependent on demonstration of good gait mechanics. Continue with soft tissue mobilization. Initiate scar mobilization if incisions closed. Gentle distraction mobilization to talocrural joint and other joint mobilizations as needed for range of motion. Incorporate functional exercises (i.e. squats, lunges, Shuttle/leg press, calf exercises, step-ups/lateral step-ups). Pool/deep water workouts after incisions closed with the use of the splint. Gait partial weight bearing to full weight bearing per quality, discharge assistive device as able. Range of motion 80% of non-surgical limb. Continue with soft tissue, scar mobilization, and distraction mobilization to talocrural joint and other joint mobilizations as needed for range of motion. Increase the intensity of functional exercises (i.e. add stretch cord for resistance, increase weight with weightlifting machines). Cautiously add lateral training exercises (side-stepping, Theraband resisted side-stepping). Progress to road cycling on flat surfaces as tolerated, short distances to start. Full weight bearing, good gait mechanics. Introduce inversion/eversion exercises with slow increase in resistance. Sports test 1 at 12 weeks. Complete and pass Sports test 1 at 12 weeks. No high impact activities X 1 year unless approved by MD. Increase intensity of low impact type cardio- swimming, cycling, elliptical, etc.